A bright golden, smooth, refreshing beer with genuine Canadian taste. Clean and clear - crisp and cool. Expertly developed by a professional Canadian Brewmaster patterned on Canada's favourite commercial beers. Manufactured using the finest traditional Canadian Brewing ingredients including genuine concentrated brewing worts and fresh varietal hops to produce beers of outstanding Canadian quality. 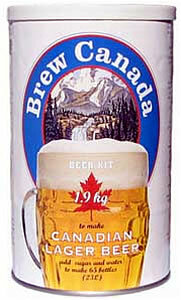 Brew Canada Lager A bright golden, smooth, refreshing beer with genuine Canadian taste. Clean and clear - crisp and cool. Bright gold in colour with a light, crisp, delicate flavour. Well balanced fruity character with a slightly sweet after-taste. Large diameter rigid siphon rod with anti-sediment tip. Fits large racking tubes. Holds racking tube in place.